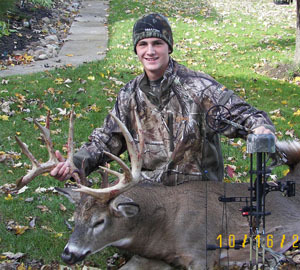 October 15th 2011, opening day of archery I shot a buck of a lifetime. It was a Saturday morning here in upstate NY when I went to a stand a few miles away and passed on an eight pointer and two does early in the morning. At about 3:30 pm I drove to another stand and started to spray everything down with scent elimination spray as I do every time I enter the woods. Then I put raccoon urine on my boots and headed into the woods towards my stand. This stand had been up for about two weeks since my friend Bobby and I came out to find a suitable tree for my new hang on. It’s a split tree trunk offering a couple trunks to help hide me as I sit in my stand. It was cold and wet; wind was blowing and it only got up to about 53 degrees F that day. We got almost a ¼” of rain so there were no leaves crunching and noise everywhere from the wind. Not a single thing walked within sight until a little after 6:00 pm when a deer came out. The wind was gusting, at times over 50 mph and the rain continued. I saw the deer out about 50 yards directly north of me. I stood up to get ready; got all set up and watched it walk up then start to angle away. It then arched back to within about 20 yards. At first I thought it was just a doe, then I saw antlers and thought “oh that’s a four pointer”, then “no wait, that’s the nine pointer”. I didn’t have any more time to look at him, once I saw what I thought was more than eight, I made the decision this is a shooter. He was starting to make a rub, lowering his antlers down on a small tree. I raised my bow and began to draw when he busted me! I was only at quarter draw, so as he looked my way, I drew back and immediately pulled the trigger. He was angled towards me so I had to aim in front of his shoulder. He turned and ran and I saw my arrow in him, so I knew my carbon arrow found its mark. It all happened so fast. I watched him run and noted the path he took. I called my Dad and told him the great news. I had set up a trail camera near this tree back in August and September and captured a couple pictures of some nice shooter bucks. My Dad had seen these pictures so when I was talking with him, I told him that I thought it was the monster. It was while I was talking to him that my heart started racing and I began to realize what might have just happened. I said I want to give him some time and Dad agreed. He said to find my arrow and first blood then slip out and come home. I did just that and we talked about how long to wait based on the shot and the weather conditions. We really didn’t want to wait much at all, but decided at least an hour would be good. We had company on their way over, my friend Clayton and his family so our parents could work on a senior night brochure for our varsity soccer team. Clayton and I are 2 of the three captains for our soccer team. Thursday the 20th was senior night. Clayton’s father had shot a nice 8 pointer that same evening I did, so Clayton and his mom came over without him at first. So Clay, my Dad and I got flashlights and a roll of toilet paper. My Dad said it’s to mark the blood trail; it helps to determine real blood from all those wet, shiny red spots on the leaves! The three of us got in my truck and went back to the woods near my stand. We walked in and I took them right up to my arrow and explained the whole story again. We marked the first blood and then starting looking for more. It wasn’t great, a couple spots every 8 yards it seemed. We even found a large footprint that threw dirt and mud up on the nearby leaves and knew that had to be him. At one point I even got back up in my stand to try and direct Dad and Clay down the path I thought he took. We had to constantly look back at the trail of toilet paper and then look ahead as we fanned out in search of more drops. At this point we were about 40 yards, only maybe 5 spots of blood marked and we decided to look up again with the flashlight. It was then, that we caught the glimpse of the deer. He was laying down with his back to us. The flashlight lit up his tail first and went to the left across his back and then we all saw his rack laying up at an angle off the ground like a kickstand. My Dad had grabbed the video camera, so he stopped us and said “wait! Don’t move till I get this turned on”! Once it did, we walked up to it as he filmed it. I touched his back with my foot and he was down! Clay and I sat down near him and I just lifted his rack with the flashlight in one hand and we all knew it was the Monster! We enjoyed the moment a bit as Dad filmed it all. I couldn’t believe it! I counted 17 points on it and admired the hooked brow tines. I did it; I got the buck of a lifetime in just my fourth year of hunting! We looked it over to see where my shot landed and found that it drove straight down into the vitals behind the shoulder. As I field dressed it I found the other half of my arrow and realized it did not penetrate out the other side down low. It was just inside the skin and that’s why it didn’t bleed that great. When I took the arrow out and then looked at the vitals, I found the mark where my arrow went straight through his heart. All three of us dragged it out of the woods and over to the edge of the field where we could drive the truck down to pick it up. My Dad stayed with the deer while Clayton and I walked back to get the truck. We drove him home and went in to get everyone else. Clayton’s father was there then and celebrating his eight pointer. When he saw what we had in my truck he said he was going to have to celebrate even more! I think it was after 9:00 by then, and my grandparents came over to take some pictures and it seemed like people were coming and going till midnight or so. It was a lot of fun – people had all kinds of questions and wanted to hear the story over and over again. It’s a story I don’t think I will ever get tired of telling. 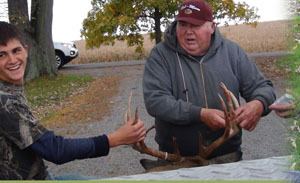 We found out Bob Estes, the first president of, and the founder of The NYS Big Buck Club, lives within 20 minutes of us. As a certified measurer we made an appointment to visit him and his wife Sally at their farm in Caledonia. Bob must be part comedian as he had us laughing most the time with his quick wit. He came out to my truck and measured my buck. I gave him a hand with the tape and Dad recorded the measurements. He invited us in, where he and Sally worked the numbers and educated us on how it could be scored as a typical rack with all the deducts or, how it could be scored as a non-typical. It has a green score of 181 3/8 gross, non-typical. We have to wait the 60 day drying period and then have it officially scored, and then I can submit the score card for consideration in the record books. We then made arrangements to meet with Bill Yox, a World Champion Taxidermist that lives about 15 miles north of us, to have him cape it out and choose the mount I wanted. Looking forward to that mount! Then the next day my Dad dropped it off at Joe Bezon’s butcher shop, where we had regular sausage, breakfast and Italian sausage, and chops made up. Which, by the way, the breakfast sausage was the only thing we tried so far, Mom cooked it with a little maple syrup and it was delicious!!! Can’t wait to try more!